I saw the Real Fifities Band many times in the early eighties, but the band existed already in the seventies. In the seventies there were very little Dutch bands playing this kind of trying-to-sound-as-authentic-as-possible fifties rock’n’roll. Actually, the only other band I can think of was Mr Big Feet & The Donuts. They made a 45 too, but today I want to write about the Real Fifties Band. They recorded an EP in 1979. With three covers and one song written by the singer (Jan van Gestel) and the lead guitarist (F.J. de Louw). I have no clear memories of those days, but I think that only Jan van Gestel was always on stage. The rest of the band varied from time to time. Apart from the rhythm guitarist Woody, who was still playing a few years ago, I have no idea what became of the other guys on this record. When I asked Google, I found out that the band has given a reunion concert in Maloe Melo in 2005, with the original band members, but I couldn’t find any information on how that was. Nor any other information on the band. 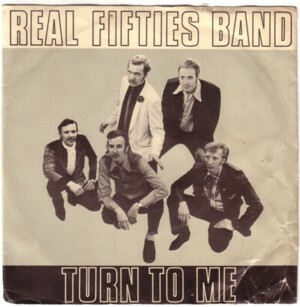 That is how things often go: the Real Fifties Band was for years the best Dutch rock’n’roll band, but only thirty years later they are almost forgotten. I wouldn’t mind getting a CD with all the recordings (if those exist!) of the Real Fifties Band. I remember some great gigs, in The Last Waterhole for example, and of course in The Rock’n’roll Café. Here is the song that Jan van Gestel and F.J de Louw wrote for this hard to find EP: Doin’ time (in the prison of love) . And, oh yeah, Jan was a great fan of Elvis! Nou ja en via google kwam ik op jou adres en ik dacht het zal toch niet die Frits Jonker zijn. I have loads of Real50’s CD’s. Happy to send them to you. Although, now it is 5 years later.